It’s hard to imagine how unbelievably worked up America got almost five years ago when NBC attempted to rearrange its late night television universe and Conan O’Brien stiffly rebuked its suits. Especially when you consider one of O’Brien’s public rationales for doing it. Conan didn’t technically get kicked off of The Tonight Show (though it’s often remembered that way). Instead, he walked away because he essentially didn’t feel like hosting a show any time other than 11:30(ish) PM was the gig he signed up for. In other words, he still really valued the concept of The Tonight Show. It was almost enough to make entertainers in the minority opinion (at least at the time) want to shake Conan and say what Jerry Seinfeld said not too long after: “‘There is no tradition! (After 16 years), you should get it: there are no shows! It’s all made up!. '” Seinfeld’s sentiment was echoed by David Letterman’s former producer Peter Lassally in the early 1990s. Lassally is quoted in the legendary 1990s book The Late Shift as having to verbally browbeat into David Letterman’s head that Johnny Carson’s ubitquious Tonight Show didn’t exist anymore. **Full disclosure: I consider myself a Conan O’Brien fan. Still, I don’t feel like his show is a “late night thing” to me. It can be if I so choose to be. However, there’s nothing about watching Clueless Gamer (which is outright hysterical, by the way) that evokes a sense of time, even if it entertains me. Funnily enough, Conan’s early earnest, though often fumbling attempts on NBC did evoke the late night feeling much more, at least for me. Hey everybody, remember Greg Kinnear? 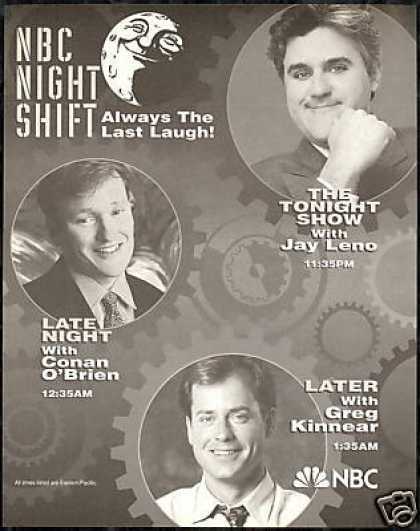 This isn’t important either, but it’s just an aesthetic opinion: I feel like the last true network “late night” show airs tonight. Not at the coveted 11:35p slot but at 12:35a. 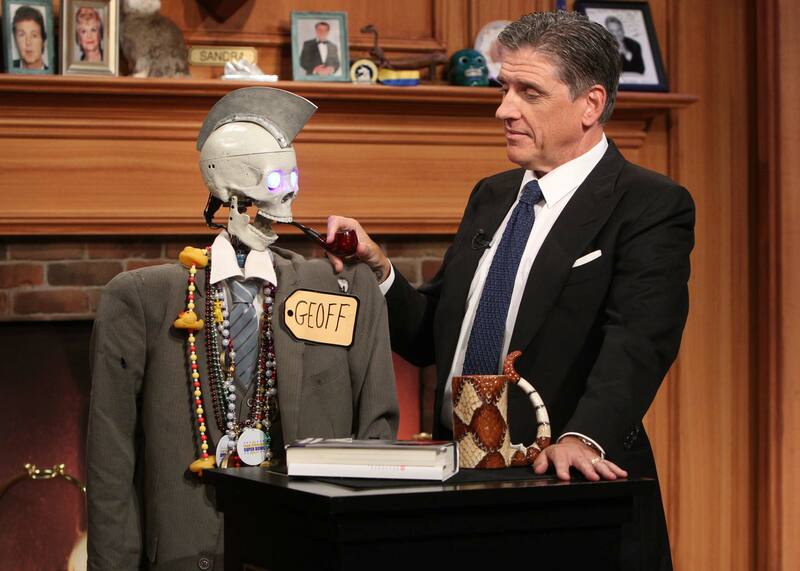 Tonight, the last episode of The Late Late Show with Craig Ferguson (with Lassally serving as Executive Producer since 2009 and with Leno as Craig’s final guest) airs. And yes, that marks the death of late-night television for me. Or that is to say, the death of late night as I knew it. Let me first clarify that this is not meant as a disparaging comment towards any current crop of late night hosts, be they major network or otherwise. Each has their own talents. Yet, as stated above about O’Brien, their shows seems like the same time-shiftable material any variety program would offer. Craig Ferguson, in all of his glorious, semi-improvised Scottish splendour, was the last to feel like his show was genuinely meant to be late night. His was a show you were supposed to stumble into after a late-night of trivia at the bar (or an early night at the bar for anything else, I suppose). I came upon Ferguson’s version of The Late Late Show several years after its inauspicious start. By complete happenstance, as I laid my head down on the pillow at 12:35AM (roughly), I flipped to CBS and saw this. It was, suffice to say, quite random and quite absurd. It was….well, it was almost 1 in the morning and it felt that way. Thus the great irony in the tagline that Craig Ferguson would regularly drop in his monologues on The Late Late Show: “It’s a great day in America, everybody!” (emphasis all mine). The irony being this: If any late-night talk show host still lives up to being a late night talk show host in terms of aesthetic (if nothing else), Craig Ferguson is it. “It’s a great late night in America” would have been a more fitting salutation, even if every late night talk show is filmed in the day (something that Craig didn’t mind reminding you about…a lot). We’ve come through an age where viewers upped their time-shifting massively. Only now, they’re gradually being swayed back to being more time-intensive viewers by fear of being spoiled by social media. ** But talk shows (not celebrated as a “high social” form of viewing anymore) may just be immune to the tidal shift back because there’s not too much to spoil, unless a talk show host has an incredibly au courant level of social confession to make. Full disclosure #2: Yes, I’m being a fanboy with this blog entry because some stuff will be written about Ferguson’s exit, but not nearly as much as the usual 11:35pm dramas. Yes, historically speaking, David Letterman’s retirement next year is probably more important since he probably is more responsible for the 12:35am aesthetic than he’s comfortable admitting as a man who wanted to desperately be Carson’s spiritual successor instead. And yes, last night’s overly-celeb-stuffed exit by Stephen Colbert before he succeeds Letterman probably underscores the grandiosity of that timeslot. But folks, Craig Ferguson is, and soon-to-be-was, a helluva late night talk show host. Ferguson has all the redundancies of catchphrases and repetitive “oh my show is so cheap” self-depreciation, but buried within that was more distinct and original comedy than anyone else. Most late night talk show hosts essentially recycle the same monologue for 4-5 nights in a row, just changing the wording about each item they plan to joke about. Craig Ferguson delivers a completely different monologue on a completely different subject each night he hosts. He reads emails and Tweets from his viewers every night: the same “sketch” but because the viewers are different, he can change his riffs as he pleases. So there’s just general talent on display. **Lest you think this informality only lent itself to the frivolous…who’da thunk a late night talk show host would pull this Peabody winning performance off. To be fair, Ferguson (or perhaps more accurately, his producers) always flirted with the dangers of success in a way that threatened to deprive his show of its diner’esque charm. I used to use his show as an example to my GSTV students of how you can accomplish a lot in a small studio space…then his studio got bigger. His was the last late night show to go HD…it was long overdue but could have felt like a betrayal of the “oh, this late at night we can’t be fancy. He decided to counteract this with the best possible cold open for a “this ain’t Letterman’s budget even though Letterman’s company pays me” show. When his robotic sidekick Geoff began to develop more than a ten-word vocabulary, it seemed to counter what his invention was meant to deconstruct (how the role of late-night sidekick could theoretically be reduced to monosyllabic metaphorical bootlicking that “even a robot” could do)…instead, it ended up reaffirming the character as a sidekick that was, in fact, genuinely hilarious. Even his theme song seemed like it should stay primitive rather than epic…but I never stopped singing along even when its recording got shinier. He also brought a pathos to his show that seemed oddly fitting for his timeslot also. Again, emotional confessions and sober second thoughts are hardly the private reserve of the night hours, but something about when Ferguson got serious evoked that late-night diner chat you had with an old friend that was “getting real with you for a second” over that last cup of coffee you shouldn’t have ordered. Rather than take the day off or take a moment and move on regarding his parents’ passings, he memorably eulogized each of them. You felt like you were the last one Craig was speaking to after all of the funeral services. In many ways, I feel sad to have missed out on the first airing of arguably the absolute highlight on the serious side of the ledger: a memorable explanation of why he wouldn’t joke about Britney Spears’ public troubles in 2007. He managed to come across self-effacing, life-affirming and completely non-judgmental in his “getting real” moment about struggling with addiction. But it did prompt me to immediately turn to him for the sober second thought (even as his audience was laughing) about Charlie Sheen in 2011. – When Craig Ferguson talked to his guests (and his audience), it didn’t feel canned. It felt like a postbar chat with his chums. – His actual brand of comedy, particularly to open the show, had an upscale cable access aesthetic simultaneously contradicting his stature yet fitting his timeslot. – He managed to capture this aesthetic while being the host most blatantly lampshading when his episodes are actually recorded. – His show enders…the best ‘last call’ concept for a TV show you could want (no offense to Carson Daly), even their odd anticlimaticism befit the genre. That’s why it’s a bittersweet day in America, everybody. There are many talented comedians whose shows happen to air late at night, but really it’s all a DVR webfest for me. ** The old late night is dead. Dave, turn the lights off when you leave the room, K? **The irony of commemorating Ferguson’s timestamp value by linking online footage…not even remotely lost on me. They’re entertaining any time of day but best enjoyed between the hours of 12:35a-3:35am…just one man’s opinion.